Stuck with a renovation or a difficult stain? Why not ask our dedicated team of experts for some advice on products and methods to help resolve the problem? Search our database to find any previously asked questions or alternatively submit your question below and we'll get back in touch in regards your cleaning or restoration needs. The first course of action is to thoroughly clean the leather first removing any ingrained dirt. You do this using the Leather Ultra Clean, and it makes the next processes a lot easier. You can change the colour of leather using a leather colourant kit (http://www.furnitureclinic.co.uk/Leather_Colourant_Kit.htm). The kit is a 4 stage process, starting with cleaning the leather down with the leather prep & alcohol cleaners. This cleaning process will remove the old finish from the leather, indicated when you see colour rubbed off onto your cloth. This process (as it removed the finish) will also remove any minor creases & cracks from the leathers coating, making the surface softer and smoother. Any severe cracking can be filled in using the Heavy Filler, Leather Binder or Flexifil if necessary. You then proceed to sponge a coat of colour onto the leather, followed by a spray on coat (spraying equipment included) to give a nice even finish. You can use this kit to change the colour of leather to any colour you want; regardless of if it is lighter or darker. The colour is then sealed in with the super seal finish for a very strong long lasting finish, and you can then achieve any sheen you want by applying either a matt, semi-matt, satin, semi-gloss or gloss finish afterwards. Finally, you will need to apply some Leather Protection Cream, which not only feeds, nourishes, and protects the leather, but also re-instates the luxurious leather aroma. 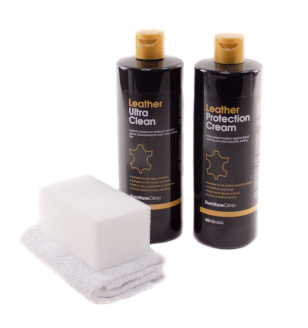 Every 3-6 months thereafter, you should clean the leather with the ultra clean and reapply the protection cream. Small Bundle – Footstool £84.90 or £84.90 (colour matched): 500ml Ultra Clean, Small Leather Colourant Kit, 500ml Protection Cream, sponges, cloths and accessories, P&P. Medium Bundle – Armchair £109.90 or £119.90 (colour matched): 500ml Ultra Clean, Medium Leather Colourant Kit, 500ml Protection Cream, sponges, cloths and accessories, P&P. Large Bundle – Sofa £124.90 or £134.90 (colour matched): 500ml Ultra Clean, Large Leather Colourant Kit, 500ml Protection Cream, sponges, cloths and accessories, P&P. Extra Large Bundle – 3 piece suit £159.90 (free colour match): 500ml Ultra Clean, Extra Large Leather Colourant Kit, 500ml Protection Cream, sponges, cloths and accessories, P&P. are any of your products suitable for re-colouring metallic leather shoes? If you send me some photos of the problem areas, I will advise you accordingly on potential products to use and what procedures to follow to restore the colour to your shoes. Has the scortch mark puckered the leather? If not, the Touch Up Kit works by providing you with a base colour in the general colour of your leather. Because there are so many shades of each colour you are also provided with a selection of tints which allow you to adjust the shade of the colourant until it matches the leather exactly. The kit also contains Leather Finish which is applied once the colourant is dry. This seals the colour in and also determines the correct level of shine to the leather. If you think you will have trouble matching the colour yourself we also have a successful colour matching service available. If you send us a sample of the leather we will be able to match the colour for you for an additional £5.05. This additional fee also allows you to select a custom colour from any of the online colour charts, this is particularly handy when working on car interiors. I have a Paul Costelloe Black sheepskin jacket. The wool side is a beautiful,reddish tan. It is in need of cleaning and some tlc, but I am not prepared to give it to a high street cleaner as I've had many straightforward fabric items ruined by the smell of cleaning fluid that can never be removed. Would it be possible to have my jacket cleaned and the black colour refreshed? If this is not a service you offer, can you suggest a company who might? Thanks for your email. We have a sister called Handbag Clinic, who also deal with clothing and footwear. You should contact them directly; their email address is enquiries@handbagclinic.co.uk, or you can ring them directly on 01207 279963.
i HAVE A LEATHER SETTEE THAT HAS A MARK THE SIZE OF A TENNIS BALL ON ONE OF THE ARMS THE LEATHER DOES NOT ABSORB WATER SO I DONT THINK THE BALM WOULD WORK.WHAT PRODUCT WOULD BE BEST PLEASE. 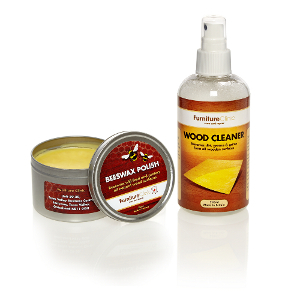 If the leather is not aborsbent, have a look at the Leather Repair Touch Up Kit. As the name states, it is great for touching up areas of pigmented leather where the colour has come off for whatever reason.